The people at tripwire wrote a interesting post about how cheap it can be to use a online rental Distributed Denial of Server attack offering. The original post can be found HERE. An important note is that most companies shouldn’t be worried about the cheap offerings however its crazy how many are available that cost around 5 bucks. You can also learn more about DDoS reading a post I wrote HERE. 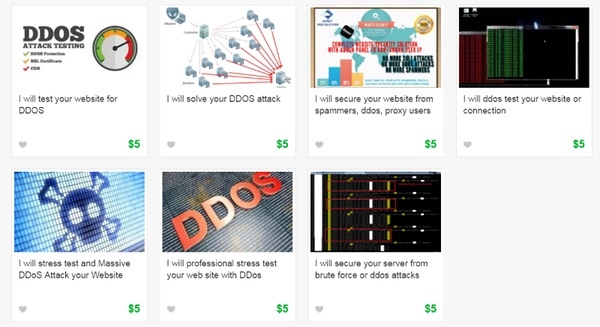 That’s the finding of Incapsula security researchers Igal Zeifman and Dan Breslaw whodiscovered that “DDoS testing services” were being openly offered for hire on Fiverr for as little as $5. A mere five dollars is an extraordinarily low figure for a DDoS attack, and suggests that the large number of people able to offer similar “services” has pushed the price down. Last year, for instance, a study by Incapsula found the average cost of an hour-long DDoS attack was considerably higher (although though still absurdly affordable) at $38. As more and more organizations become reliant on their internet presence to do business and stay in touch with their customers, so the potential increases for distributed denial-of-service (DDoS) attacks to strike a painful blow.